US Fish & Wildlife Svc. “Jeepers creepers, where’d you get those peepers?” featuring pinless peepers. I know what to do with the sadness and the anger… But where to put the shame for our ugly species? Makes me pretty mad and I do my bit by spreading the word. What else can we do to make a worldwide impact? I’ve tempered my anger and despair with one consolation. According to BP and other oil companies, there is only 50 years left of global oil reserves. That’s including “dirty oil” like the Canadian tar sands and does not factor in any future human population growth. So, very soon, modern civilization as we know it will come to and end. Does that make you feel any better? I know it does me. speciesism is everywhere and so thoroughly normalized that it’s invisible in plain sight. Once you’ve seen it, though, you can’t un-see it, and then you’re screwed. It’s amazing to what lengths people will go to not see it. I was thinking about it today…folks digging in their heels about adopting a plant-based diet/lifestyle. Most have to know they’re eating crap. And know that eating crap makes them feel like crap. What is so distressing about not eating animal products anymore? I have to believe it’s the level of brainwashing; otherwise, I’m stumped. What are they afraid of? It’s the wrong thing, whatever it is. ” I have to believe it’s the level of brainwashing…” Yes, and the constant marketing reinforcement, and the fact that animal food is so cheap because it’s so heavily subsidized, and the suffering is invisible, and meats are tied to religious and patriotic traditions, and humans’ taste buds have been manipulated to crave fat, sugar, & salt, geez, it’s so many things; ultimately because speciesism rules, and humans feel entitled to use, abuse, and exterminate animals for whatever reason and in whatever manner benefits us. How do we go up against the monster animal-industrial complex (the alliance of industry, government, and education)? Beats me…maybe as Allison says above, we each do our bit–and hope for one heck of a ripple effect? (Talk about your David & Goliath struggle…) Divya is banking on a fossil fuel apocalypse, but it could be that the mother of all mutating pathogens from factory farming will get us first. (Karma is what that would be.) Many thanks to all of you for commenting, re-blogging, and supporting each other & all of us who work for justice. Where ideological viewpoints struggle is in resting upon the assumption that those who don’t agree must be hoodwinked, conditioned, obtuse, close-minded — perhaps even outright stupid or downright evil, etc. If one succumbs to such thinking, then I suspect, one could very well find oneself frequently livid and emotionally distraught. Perhaps the most relevant axiom to bear in mind is this: A sure sign an ideal is flawed or delusional is that it views everything outside itself as somehow flawed and delusion. Giving oneself over to an idea or ideology — particularly one that is prone to look outward with haughtiness or scorn — is a tricky business. Ideas are tools for the mind — not the other way around. I’m citing my Grandmother a lot today — but as she used to put it — if you keep having the same problem with everybody, then maybe the problem really isn’t everybody else. Wanton animal abuse is a pressing social ill. And agri-industry is an unmitigated disaster for a myriad of reasons. That said, no one group, approach or ideology has all the answers. I would recommend the documentary film “Food, Incorporated” to anybody wanting to learn more about agri-industry and the problems it creates. I think it’s hard-nosed and objective, rather than purely ideological. If anyone thinks for one minute that those who are committing these atrocities for fun, profit, etc. are going to stop because we nicely ask them to look into their hearts and see the light, they must be living in fantasy land. G-damn right I’m angry–as all of us should be. This culture is pathological and insane, and those who are causing all of this needless suffering need to be called out on it at every turn. Attempting to hold hands and sing “kum by yah” with those who are commiting brutal atrocities is an exercise in futility. It might make you feel better, but it won’t change a thing. As Frederick Douglas wrote: “Power never concedes anything without demand.” Time for us to demand justice for all living beings, and that means getting angry enough to do so. Joanne, your comment strikes me as rather unfair. I never suggested that we “hold hands” with or “nicely ask” the exploiters to stop, nor did I suggest that we shouldn’t get angry (take a look at the title of the piece). The crux of the post is here: “Once we’ve seen and can’t un-see speciesism, how do we handle our anger when its source is omnipresent?” Personally, I don’t want to be so eaten up / blinded by anger that I can’t be an effective advocate/activist for animals, and it’s my belief that lashing out in anger isn’t the best way to reach all the people who haven’t yet recognized the speciesism that our economy and lives are built on. I personally felt that if you’d followed up your examples by debunking speciesism, they would have had a much more consequential impact on the minds of those not familiar with the concept. 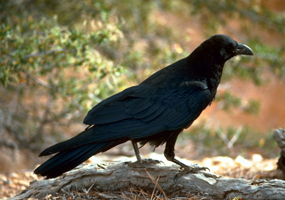 My feeling is that the response of many when reading this article would be ‘yeah, and why shouldn’t humans have the right to cull crows if it’s to the benefit of us and the sage-grouse?’. Explaining why for instance intelligence or pain-tolerance are insufficient grounds for discrimination would have added weight to the initial pang of injustice you delivered with your interesting examples of speciesism. I think most people feel similarly outraged when they come to fully understand speciesism, but until they do, it seems to me that being overly emotive about the issue can undercut credibility and come across as sensationalist. Hi Jen, thanks for commenting. I disagree that this piece is “overly emotive.” The “hook” that it’s written around is the anger that all animal rights activists have to deal with not only because of such extreme examples as these, but also because of the “routine” exploitation in daily life. As for sensationalism, the examples themselves are so extreme that one doesn’t need to embellish or fall back on angry rants. I don’t sell Animal Blawg readers short–they understand speciesism–and not just because I and other writers here have addressed it many times. For newbies who come upon it, I try to remember to include a link (as I did in the first sentence). Interestingly, a previous commenter took me to task for not being angry *enough*! so maybe I hit the mark in just the right place! I’ve shared this post across my various networks today, keep up the good work. that is not right we should brand words in you just incase you get lost.